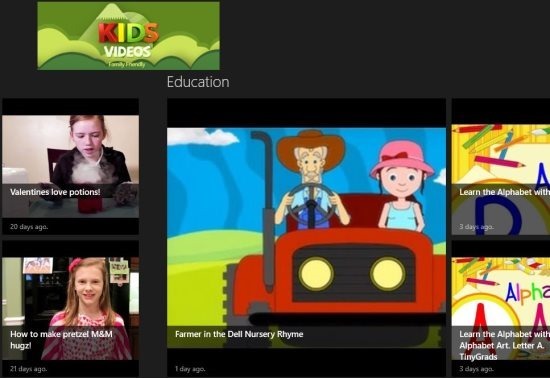 Kids Videos is a free Windows 8 videos app available under “Music & Video” category of its App Store. This video app for Windows 8 lets you play videos which you can easily watch with your kids and family. The app delivers videos from various sources which all are hosted by the popular “YouTube”. All you need to do is just launch the app and it will give you a collection of videos added to its library. Select a video you want to watch and start playing it online via YouTube. Well, this Windows 8 video app makes the video filtering even easier by providing you the videos in the categorized format. You can scroll and switch between the categories like education, music, kid’s life, animals, cartoons, and more. Also, all the videos of each category all sorted according to their age. Newly added videos appear first in thumbnail view. Many a times it happens that you like a video so much that you want to share it with your loved ones. For this, you can copy the video URL and send the same to your friends and others. To copy the video URL, right-click on the video and you will find the option to copy the URL. Let me quickly point out the key features of this kids videos Windows 8 app. Also, check out our posts on Tom & Jerry Apps, and YouTube Apps. Play videos which you can easily watch with your friends and family. All the videos are categorized in a nice way. Videos are hosted by YouTube. Videos are sorted according to the age. To download and install “Kids Videos” app, just launch the App Store of your Windows 8 and search for the same. Click on install button and you are done with. Coming to the end, I would simply say that this Windows 8 video app is just great to watch videos with your kids and family. I like the simplicity and categories assigned to the videos. Now, if you are shedding tears to watch cartoon, then open your Windows 8 and make then watch funny cartoon videos. Download Kids Videos app in Windows 8.